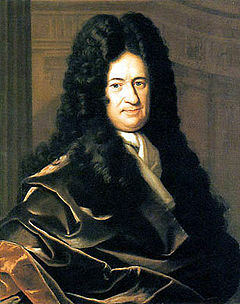 Matamaiticeoir agus fealsúnaí Gearmánach ba ea Gottfried Wilhelm Leibniz (1 Iúil 1646 – 14 Samhain 1716). Cheap Leibniz agus Isaac Newton an calcalas timpeall an ama chéanna agus go neamhspleách ar a chéile. ↑ "Gottfried Wilhelm Leibniz Bibliothek - Leibniz" (Gearmáinis). Tugadh an leathanach seo cothrom le dáta an 25 Meán Fómhair 2017 ag 05:12.